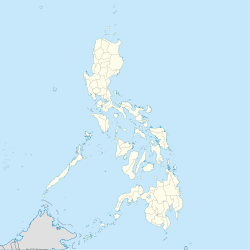 Kinoguitan, officially the Municipality of Kinoguitan, is a 5th class municipality in the province of Misamis Oriental, Philippines. According to the 2015 census, it has a population of 14,391 people. The town name Kinoguitan is spelled by the old folks especially during the early 1950s as Kinogitan. Kinoguitan is politically subdivided into 15 barangays. In the 2015 census, the population of Kinoguitan was 14,391 people, with a density of 340 inhabitants per square kilometre or 880 inhabitants per square mile. ^ "Province: Misamis Oriental". PSGC Interactive. Quezon City, Philippines: Philippine Statistics Authority. Retrieved 12 November 2016. ^ "Province of Misamis Oriental". Municipality Population Data. Local Water Utilities Administration Research Division. Retrieved 17 December 2016. This article about a location in Northern Mindanao region is a stub. You can help Wikipedia by expanding it. This page was last edited on 24 February 2019, at 09:33 (UTC).